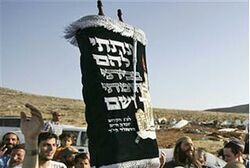 Gangs in Tunisia set a synagogue on fire, which burned a Torah scroll, and damaged four Jewish-owned cars Monday night as chaos and sabotage began to break out after the revolution two weeks ago. No injuries were reported. The small synagogue is located in the southern city of Gabe. Cars were damaged in Djerba where Al-Qaeda terrorists killed 21 Jews in a synagogue in 2002, the last time a Jewish institution was attacked in the country until this week. Djerba is home to most of Tunisia’s Jews. After the street revolution that toppled the 23-year regime of Zine al-Abdine Ben Ali, the Israeli Foreign Ministry airlifted 21 Israeli tourists from Djerba. Gangs also went on a rampage in schools in the capital, and the army deployed forces to stop the chaos that has followed the street revolution two weeks ago. The revolution toppled the 23-year regime of Zine al-Abdine Ben Ali. The United Nations said 147 people were killed in the uprising. Posted in Terrorism and tagged Crime, Islam, Jihad, Muslims, Riots, Terrorism.